1625-1633 Henry Saunders, bailiff of Isleworth Hundred encloses 10 acres from Hounslow Heath. 1635 Moses Glover's map of Isleworth Hundred shows a farm of some 12 acres owned by Henry Saunders. 1636 George and Francis Wilson acquire Saunders farm. 1647 Elizabeth Hulbert inherits the farm. 1670 Randall Nunns, Elizabeth's husband, sells the house and land to Gideon Awnsham. 1673 Edward Calamy buys the house and 12 acres. 1677 Edward Calamy surrenders the property to Dorothy Flowers. 1697 Dorothy Thompson, Dorothy Flowers' daughter, inherits the property. 1715 Dorothy Thompson sells the house and land to William Leeson. 1718 William Heath acquires property. 1722 William Heath sells the house and land to Archibald Campbell, Lord of Islay. 1725 Enclosure of a further 12 acres from Hounslow Heath granted by the Manor Court of Isleworth Syon to Lord Islay. 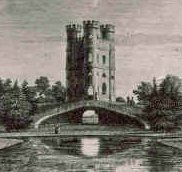 On this new land and the land bought in 1722 he built his new gardens, with a Greenhouse and Aviary, surrounding the gardens with a moat. c.1730 Lord Islay has a new house built, probably designed by Roger Morris, later known as Whitton Place. 1741 Rocque's map shows the estate in its finished form, given the name Whitton Park. 1743 Lord Islay succeeds his brother to become 3rd Duke of Argyll. 1761 Death of the Duke of Argyll, his Whitton estate is inherited by Elizabeth Ann Williams, his mistress for many years. 1762 Elizabeth Ann Williams dies, her son William, by the Duke, succeeds her The Earl of Bute transfers some of the finest examples of the Duke of Argyll's trees and plants to the new Kew Gardens. 1763 Lord Shelburne leases the Duke's estate from Colonel Campbell. 1765 The Whitton estate is put up for sale, a detailed catalogue is prepared describing the buildings and gardens. The estate is sold to William Pope and others. 1767 George Gostling buys the property. He converts the Greenhouse to a mansion for his own use. 1767 George Gostling separates the estate keeping the Greenhouse, now converted for living in. 1782 George Gostling dies and his son, also George, inherits the estate. 1783 George Gostling II adds a pediment with a bas-relief on the front of the house depicting the destruction of the Titans by Jupiter. 1797 After buying back the Duke's house he employs Humphrey Repton to advise on landscaping the estate. From this date the lakes take their familiar shape. 1800-10 George Gostling II buys several pieces of land in Whitton and Isleworth, doubling the size of the estate 1818 The Enclosure of Hounslow Heath again doubles the size of the estate. 1820 George Gostling II dies in London, his widow Lydia succeeds to the estate. 1828 Death of Lydia Gostling, her eldest son George Gostling III, inherits. 1837 Death of Hannah Augustus Gostling, the only legitimate grandchild of George Gostling II Death of John Walley Gostling, a younger son of George Gostling II. On his deathbed he admits to an illegitimate daughter. This girl, Emily, is then adopted by his two unmarried sisters. 1841 Death of George Gostling III. His younger brother Benjamin succeeds to the estate. 1843 Benjamin dies and is succeeded by his brother Augustus. 1847 Augustus Gostling dies. His widow Hannah then lives there until her death. 1850 Emily Gostling marries Charles Edward Murray. 1854 Death of Hannah Gostling, the estate goes to George Gostling II's eldest daughter, Lydia. Lydia and her younger sister Maria move to Whitton with their niece Emily and her husband. 1859 Emily Murray dies following the birth of her sixth child. Two months later her aunt Lydia Gostling also dies. The younger sister Maria inherits the Whitton estate. 1874 Maria Gostling dies, by Lydia's will Charles Edward Murray inherits, and changes his name to Gostling-Murray. 1878 Charles Gostling-Murray marries Margaret Conant and has a further six children. 1892 Charles Gostling-Murray dies and is buried at Twickenham Cemetery, two thousand people attend his funeral. The estate passes to Charles' two surviving daughters by Emily. They sell the estate to provide for his widow. 1894 Whitton Park Estate is again put up for sale. it is sold on again in 1899 and 1905. 1895-1900 Grounds used as The Whitton Park Sporting Club. 1909 A determined effort is made to preserve the land within the old moat as a public park. 1911 Whitton Park House, the former Greenhouse, is demolished. 1928-1931 Attempts by Alderman James Wills to keep the area as a public park fail. 1773 George Gostling sells off the Duke's House and part of the estate to Lady Lichfield. 1781 The architect Sir William Chambers buys the Duke's House. He enlarges and improves the house and grounds. 1796 Sir William Chambers dies and the estate is sold to Mrs Dennis. 1797 Mrs Dennis sells the Duke's House back to George Gostling. 1802 Mr Agnew leases the Duke's House. 1804-7 George Simpson leases the Duke's House. 1809 Benjamin Hobhouse M.P. takes a 21 year lease (later lengthened) on the house. 1812 Lord Byron visits the house with Benjamin Hobhouse's son John Cam. 1831 Death of Sir Benjamin Hobhouse. His son John Cam Hobhouse inherits the lease, but appears not to have lived there. All images are copyright of LBRuT unless stated otherwise. For further information see Local History Notes.